Architecture differs from all other cultural artefacts by a quality which is immanent only to it: it is local, belonging to a place. Architecture responds to the found or creates, by (re)acting specifically there, a place to which it is irreversibly bound. We are not talking about the regional, historic lore or traditionalism, not about styles or architectural languages. It is all about the relationship to a specific place from which architecture derives part of its qualities. This site-specificity is also - and especially so in times of hyper-mobility - characteristic for works of architecture. Place and site-response, the significance of the physical context in architecture, have been investigated in some depth since the 1960s as part of the critical assessment of the universalism of the avant-gardes. However, there has not been systematic historical compilation and theoretical treatment of topos and site-response in architecture until now, even though its counterpart, typus, has been dealt with intensively in the 1970s and 80s. The rapid globalization of the Lebenswelt over the last decades was accompanied by a shift of interest to the spatial and local aspects of human existence. We witnessed even a spatial turn in the humanities. Therefore a fundamental treatment of place and site-response in architecture is overdue. 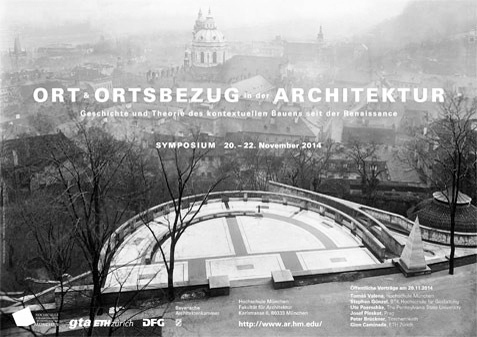 For this task the symposium shall deliver historical and theoretical foundations. Contextual design practices will be examined in built structures and individual positions of the architects, as will their theoretical reflection. Since the latter can not be expected to a considerable extent before the Renaissance, the research will concentrate on modern history.